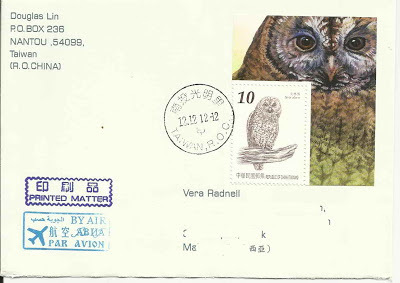 A bird with a unique postmark- 12.12.12-12. The Tawny Owl Strix aluca) is a stocky medium-sized owl commonly found in woodlands across much of Asia. Their diet consists mainly of rodents except in urban areas where birds easier to catch. Thanks to my exchange friend Douglas for sending this delightful cover.